Ever since The Goldbergs debuted on ABC last year, the hit comedy series, which is set in the 1980s, has referenced several hit movies and TV shows, such as Star Wars, Say Anything, The Goonies and an episode from earlier this month that involves the hoverboard from Back to the Future Part II. People reports that the show will continue that tradition in the second half of Season 2, with an upcoming Ferris Bueller's Day Off episode that will guest star Charlie Sheen, paying homage to his role as "Boy in Police Station." 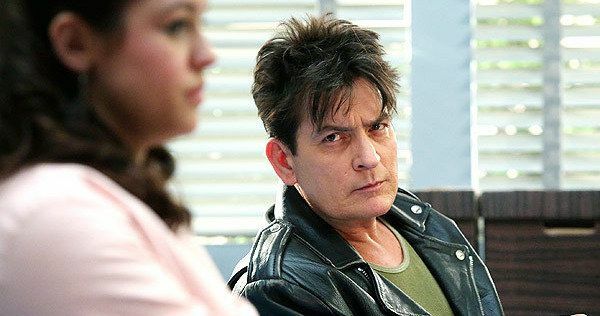 The first photos have been released from this episode, set to air in early 2015, which shows Charlie Sheen interacting with Hayley Orrantia's Erica. The episode will follow Barry (Troy Gentile), who decides to skip school one day to create his own epic "day off." Barry's plans go severely awry, and when Pops (George Segal) and Adam (Sean Giambrone) try to help Barry out, it only gets worse. After ratting out her brother, Erica finds herself in the local police station, where she meets Charlie Sheen's "Boy in Police Station." In the original Ferris Bueller's Day Off, it's Jennifer Grey's Jeanie, Ferris' (Matthew Broderick) sister, who has that memorable interaction with Charlie Sheen's character in the police station. Just a few months after playing this unnamed character in Ferris Bueller's Day Off, Charlie Sheen starred in the Best Picture winner Platoon, which helped launch his career and paved the way for roles in hits such as Wall Street, Young Guns, Eight Men Out and Major League. The Goldbergs is currently on holiday hiatus, returning with new episodes on Wednesday nights at 8:30 PM ET on ABC. Take a look at the photos from this upcoming episode below, along with Charlie Sheen's original scene from Ferris Bueller's Day Off.